LAS VEGAS--(BUSINESS WIRE)—May 11, 2015--Station Casinos LLC ("Station," “we” or the “Company") today announced the results of its operations for the quarter ended March 31, 2015. Net revenues increased 5% and Adjusted EBITDAM increased 12.5% compared to the prior year period. Adjusted EBITDAM margin increased 240 basis points to 36.4% compared to the prior year period. Eighth consecutive quarter of year-over-year net revenue growth and sixteenth consecutive quarter of year-over-year Adjusted EBITDAM growth. Same-store Las Vegas net revenues increased 4.5% and Adjusted EBITDAM increased 11% compared to the prior year period. Native American management fees contributed $14.4 million to Adjusted EBITDAM, an increase of 21% compared to the prior year period. “We are pleased to report that Station Casinos is off to a strong start in 2015, as net revenues increased 5% and Adjusted EBITDAM increased 12.5% compared to the prior year period,” said Marc Falcone, Executive Vice President, Chief Financial Officer and Treasurer. “We generated $124.6 million in Adjusted EBITDAM for the quarter, our sixteenth consecutive quarter of year-over-year growth and our highest reported Adjusted EBITDAM and Adjusted EBITDAM since the first quarter of 2008. In addition, our operational strength and efficiencies have led to a 700 basis point improvement in same-store margins from the trough in 2011. The Company’s consolidated net revenues for the quarter ended March 31, 2015 were $342.8 million, an increase of 5% compared to the prior year. Adjusted EBITDAM for the quarter increased $13.8 million, or 12.5%, to $124.6 million. Our Adjusted EBITDAM margin for the quarter was 36.4%, an increase of 240 basis points. Consumer confidence and spending levels showed further strength during the first quarter which contributed to a 4.5% increase in same-store Las Vegas net revenues compared to the prior year. The revenue increase was broad-based with growth in casino, hotel and food and beverage. Same-store Las Vegas Adjusted EBITDAM increased 11% and margins rose to 34.6%, a 190 basis point improvement over the prior year. Results from the two Native American properties managed by the Company were also strong on a same-store basis, increasing 21% and contributing $14.4 million to Adjusted EBITDAM. As of March 31, 2015, the outstanding principal balance of the Company’s long-term debt was $2.0 billion (excluding a non-recourse land loan of $113.7 million) and cash and cash equivalents were $104.7 million. Pursuant to the terms of our credit agreement, we made our annual excess cash flow payment of $61.0 million to our term loan lenders on March 16, 2015. As of March 31, 2015, our debt (net of excess cash) to Adjusted EBITDAM ratio was approximately 4.7 times, excluding the non-recourse land loan. Our significant cash flow and disciplined capital programs have allowed us to meaningfully reduce debt and improve leverage over the past several years, positioning our balance sheet as one of the strongest in the gaming industry today,” concluded Mr. Falcone. Ultimate Gaming ceased operations in November 2014. The operating results of Fertitta Interactive are presented in discontinued operations for all periods. The Company will host a conference call on May 11, 2015 at 10:00 a.m. Pacific Time to discuss its first quarter 2015 financial results. The conference call will consist of prepared remarks from the Company and will include a question and answer session. Those interested in participating in the call should dial (877) 869-3847 or (201) 689-8261 for international callers, approximately 15 minutes before the call start time. A replay of the call will be available from May 11, 2015 through May 18, 2015 at https://www.sclv.com/Investor-Relations.aspx. A live audio webcast of the call will also be available at www.sclv.com. (1) Adjusted EBITDAM is a non-GAAP measure that is presented solely as a supplemental disclosure. We believe that Adjusted EBITDAM is a widely used measure of operating performance in our industry and is a principal basis for valuation of gaming companies. 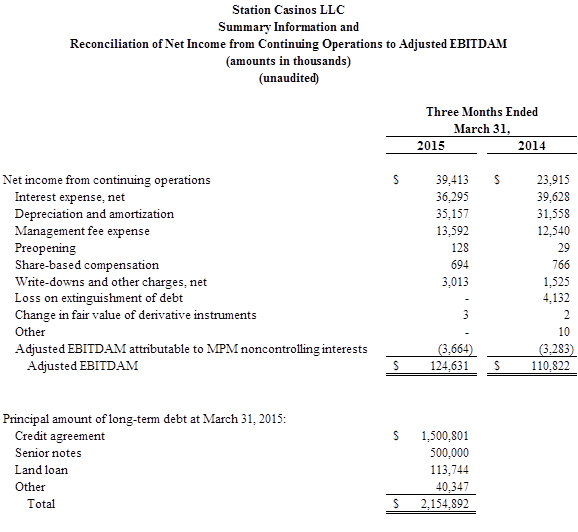 We believe that in addition to operating income, Adjusted EBITDAM is a useful financial performance measurement for assessing our operating performance because it provides information about the performance of our ongoing core operations excluding management fees, non-cash expenses, financing costs, and other non-operational or non-recurring items. Adjusted EBITDAM includes net income from continuing operations plus interest expense, net, depreciation and amortization, management fee expense, preopening expense, share-based compensation expense, write-downs and other charges, net, loss on extinguishment of debt, changes in fair value of derivative instruments, and excludes Adjusted EBITDAM attributable to MPM noncontrolling interests. To evaluate Adjusted EBITDAM and the trends it depicts, the components should be considered. Each of these components can significantly affect our results of operations and should be considered in evaluating our operating performance, and the impact of these components cannot be determined from Adjusted EBITDAM. Further, Adjusted EBITDAM does not represent net income or cash flows from operating, investing or financing activities as defined by GAAP and should not be considered as an alternative to net income as an indicator of our operating performance. Additionally, Adjusted EBITDAM does not consider capital expenditures and other investing activities and should not be considered as a measure of our liquidity. In addition, it should be noted that not all gaming companies that report EBITDAM or adjustments to this measure may calculate EBITDAM or such adjustments in the same manner as we do, and therefore our measure of Adjusted EBITDAM may not be comparable to similarly titled measures used by other gaming companies.